Despite strong support for Republican Ken Cuccinelli from white evangelical voters, Democrat Terry McAuliffe defeated Cuccinelli on Tuesday in Virginia’s 2013 gubernatorial election by a 48%-45% margin. In New Jersey, Republican Chris Christie won re-election over Democrat Barbara Buono (60% to 38%) with strong support from both Protestants and Catholics. Eight-in-ten white evangelical voters in Virginia (81%) backed Cuccinelli for governor, while just 15% voted for McAuliffe and 4% voted for Libertarian Robert Sarvis, according to exit poll results. But among all other Virginia voters, McAuliffe received twice as much support as Cuccinelli (61% vs. 31%). 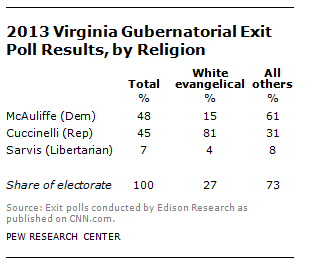 Cuccinelli received about as much support from evangelical voters as outgoing Republican Gov. Bob McDonnell did in 2009. In that election, 83% of white evangelical voters supported McDonnell. But in 2013, white evangelicals accounted for 27% of Virginia’s electorate, down from 34% in 2009. This shift reflects broader changes in the racial and ethnic composition of Virginia’s electorate; in 2013, 72% of all Virginia voters were white, down from 78% in 2009. Exit polls also show that while Cuccinelli was successful in retaining the strong support of evangelical voters, McAuliffe improved over Democrat Creigh Deeds’ 2009 showing among all other voters. In the 2009 exit polls, non-evangelicals supported Deeds over McDonnell by a 55%-44% margin. 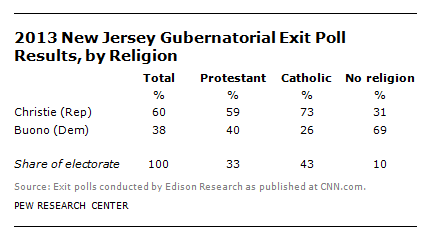 In New Jersey, majorities of Protestants (59%) and Catholics (73%) supported Christie in his re-election bid. Religiously-unaffiliated voters, by contrast, supported Buono over Christie by a wide margin (69% vs. 31%), according to exit poll results. Religious “nones” accounted for a much smaller share of the New Jersey electorate (10%) compared with Catholics (43%) and Protestants (33%). A comparison with 2009 gubernatorial voting by religion is not available for New Jersey. This report is based on the published results of exit polls conducted by Edison Research and reported on CNN.com. The Virginia and New Jersey exit polls included different questions about religion. In Virginia, voters were asked whether they identify as born-again or evangelical Christians. In New Jersey, voters were asked about their religious affiliation (e.g., Protestant, Catholic, no religion). The tallies for both states were current as of 8 a.m. ET today.